NOTE: In this report, when the text refers to an event (e.g., a death) for which an associated document is available, a link will be provided to that document. If you see a word or words in bold text and underlined, just click on it. For example, in the first paragraph you will see "Octaviano died December 13, 1935." Click on "died" to see the death record. To return to the main report, simply click the back arrow (usually in the upper left of your computer screen). 1. Son Toribio Celaya was born circa 1897 in Mexico. He immigrated to the United States with his family in 1900 and in 1910 was living with them in Terlingua. From August 1916 through December 1918, he worked as a miner for the Study Butte Mining Company. He averaged over 27 shifts per month at $1.00 to $1.25 per shift, and in May 1917 he earned $2.05 for hauling hay for the company. Toribio was still living with his family in the Study Butte area in 1920, but no information is available on him after that time. A. Daughter Canuta Celaya was born January 19, 1931 in San Vicente. (1) Son Israel Celaya was living in Fort Stockton in October 2006. (2) Daughter Norma Celaya married Joe Bueno. They were living in Fort Stockton in October 2006. (3) Daughter Carol Celaya married Michael Gonzalez. They were living in Fort Stockton in October 2006. (4) Daughter Regina Celaya married Jesus Benavides. They were living in Fort Stockton in October 2006.
a. Son Javier “JJ” Tellez died in 1999. (6) Daughter Rebecca Celaya married Frank Valenzuela. They were living in Austin in October 2006. C. Son Gonzalo Celaya was born January 10, 1935 in Brewster County. D. Son Ramon Celaya was born August 30, 1936 (a). From 1942 to 1966 he lived in Fort Stockton, where he worked as a service station attendant. He died of a gunshot wound February 8, 1966 in Fort Stockton and is buried in the Catholic Cemetery. E. Son Emilio Celaya was born August 8, 1938 in Boquillas, Texas. He died there three days later of unknown causes – there was no medical attendant. He is buried in Boquillas. (1) Daughter Rosa Mary Celaya was born June 17, 1960. She died in Fort Stockton November 16, 1960 and is buried in the Catholic Cemetery. G. Son Lucas Celaya was born October 18, 1941 in Brewster County. H. Son Pas Celaya was born May 23, 1943. He died of pneumonia in Fort Stockton September 2, 1943 and was buried there the following day. 3. Daughter Maria Celaya was born August 28, 1903. In 1910 she was living with her family in Terlingua, and in 1920 in the Study Butte area. She married Fermin Salas October 11, 1923 in San Vicente, Texas and they had six children. See http://www.lifebeforetheruins.com/epifanio-salas.html for details and for more information on the Salas family. 4. Daughter Dominga Celaya was born December 11, 1906. She was baptized in Terlingua by Father Brocardus September 18, 1907. Her godparents were Tiburcio Martinez and Romalda Hernandez. In 1910 she was living with her family in Terlingua. 5. 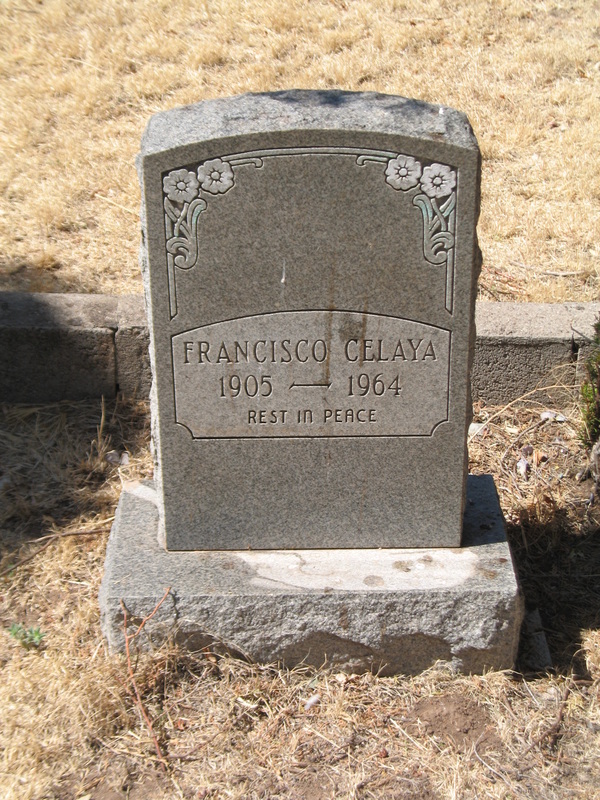 Son Francisco Celaya was born September 15, 1907. He was living with his family in Terlingua in 1910 and from 1945 to 1964 he lived in Alpine. He died June 11, 1964 in Brewster County Memorial Hospital and is buried in Holy Angels Cemetery. 6. 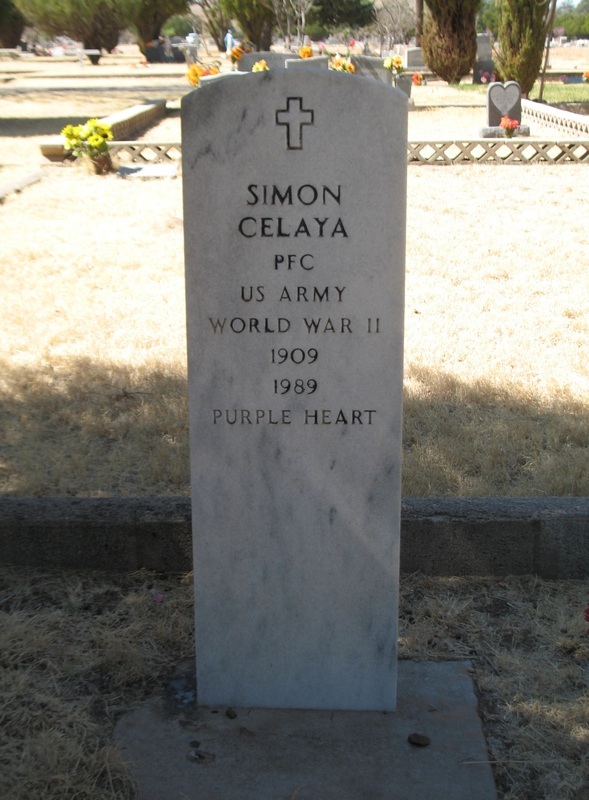 Son Simon Celaya was born September 27, 1909 in Terlingua. He was baptized November 3, 1909 in Chisos by Father Brocardus. His godparents were Tiburcio Martinez and Romalda Hernandez. From 1924 to 1942 he lived in Brewster County and worked as a ranch hand for Bob Cerna on the K-Bar Ranch and for Waddy Burnham at Government Springs. He served in the U.S. Army during World War II and was awarded the Purple Heart. After his military service he worked for Big Bend National Park. He died in Alpine November 7, 1989 and is buried in Holy Angels Cemetery. His death record indicates he was born in Castolon. That seems unlikely since the family was living in the San Vicente area at the time. Brewster, Pecos, Winkler County death records. 1910, 1920 and 1930 U.S. census records for Brewster County. Big Bend National Park Oral History Program, Simon Celaya interview. Study Butte Mining Company payroll records, W. Keesey Collection, Archives of the Big Bend, Sul Ross State University, Alpine, Texas. Esperanza Quintela Celaya obituary, Fort Stockton Pioneer, October 27, 2006.